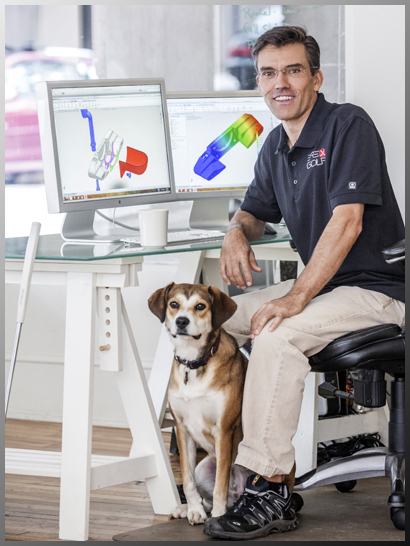 Brex Golf was founded in the spring of 2012 but the true genesis began twenty years earlier when Brett Burdick designed a golf putter that was inspired by physics and his sense of creative investigation. Of course, this was before the availability of 3D modeling systems so the calculations for head weight and center-of-gravity were performed manually. This first prototype, which remains unique today, was for Brett’s personal use and wasn’t developed for production and resale… but the seed had been planted. Educated as an Electrical Engineer, Brett Burdick was drawn to industrial and mechanical design which he was eventually able to incorporate into his profession as an avionics systems engineer. Eventually, he was drawn to pure design work as head of product design and development for a small consumer electronics company. As an aspiring artist, he describes industrial design and product development as the happy marriage of art and engineering. It’s this sensibility that also inspired his studies of the attributes of the left and right sides of the brain and the philosophy of Putting with Both Sides of The Brain. As a result of his product development design work, Brett received several utility patents for products that sold worldwide. Since 2004, Brett has engaged in engineering design consulting work for medical and consumer products companies, with one innovative product receiving a utility patent. Brett has been an avid golfer since his childhood days of hacking practice balls around his neighborhood but has always had a penchant for the equipment side of things (which might explain his middling handicap). Several years ago, Brett had the inspiration for the Half-Pipe alignment system for which he received a US Design Patent. Due to his previous business commitments, it wasn’t until 2012 that he was able to devote full attention to the development of unique putters and accessories which are available on this website. We will only sell golf products that are clearly unique – products that will never be confused with other manufacturers’ products. All products will be manufactured with the highest quality materials using precise manufacturing techniques. Our products will offer golfers true benefits to their game. Each product must represent good value to our customers. And, most importantly, we will operate our business honestly, truthfully and will always aim to satisfy our customers’ needs.